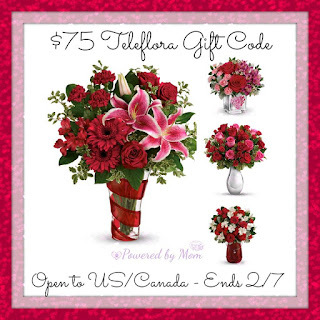 Read Powered by Mom's review on her beautiful Swirling Desire Bouquet HERE. One lucky reader will win a $75 Gift code to Teleflora (Valid thru 2/12/2018) PLUS FREE delivery! Giveaway ends 2/7! Open to US & Canadian residents 18+ and older. I love tulips so the Precious Pink are a beautiful setting. I would choose the passionate purple tulips. With the rest of the gift card I would get a nice bouquet for my daughter.